One of the best ways you can help your child develop a love of learning is to help them discover a love of reading. For some children reading is a very difficult task in the beginning. The letters and words just don’t seem to flow together as it does for other children who seem to be natural readers. But with a little help and encouragement, you can let your little ones develop at their own speed. Read books together as often as possible. Let your child choose some of the books you will read together. 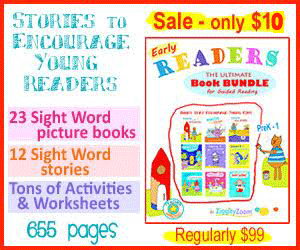 Select stories to read together that build on your child’s interests. Ask open-ended questions about a story’s characters, setting, and events in the story. Discuss your child’s answers by repeating the answer, clarifying the answer, or asking more questions. Encouragement your child to give input into the story. When a new vocabulary word is introduced, give the definition and then re-read the page substituting the new vocabulary word with the definition. Act out some of the stories for reinforcement and just for fun. While reading, point out letters and words on the pages and show the progression of reading from left to right and top to bottom. Be an example of how much enjoyment can be received from reading.